Summer is winding down (the truth hurts, y’all) but the Outreach Prodgineering team is just starting to turn up the heat. Here are the sizzling new releases we brought you over the last month! Last month, we announced the new and enhanced Outreach Voice Suite. We launched major new features to amp up the way you use the Outreach Voice dialer. Now, texting, conversation intelligence tiles, and back-to-back sequencing help you increase connect rates and focus on having winning conversations. Read our full announcement for more, and learn more about the capabilities we launched in the new Voice Suite below. We launched Texting in Outreach to give your team a new way to reach buyers and customers with the right message at the right time in the right way. Now reps can text contacts from Outreach to build stronger relationships with customers, get immediate responses, and share visibility into every step of the sales cycle. Texting is available in Early Access - check out our announcement to learn more and join the early access waitlist! It’s important to have a voice solution that sets you up for successful calls, but it’s just as critical to have the tools at your fingertips to understand what differentiates a successful conversation from a flop. 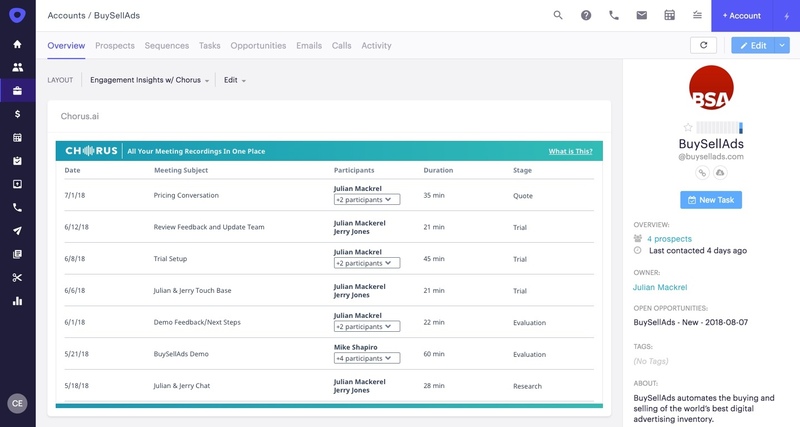 We’ve worked with the market leaders, Avoma, Chorus.ai, ExecVision, and Gong, to build native integrations with Outreach’s Sales Intelligence Tiles so you have access to your conversation intelligence data right where you need it -- where you’re actually making calls! You can try the Chorus tile today or stay tuned for new tiles from Avoma, Execvision, and Gong. Now, we have a new way to level up the way you reach out to your contacts and increase your chances of connecting: Back-to-back sequence steps. With back-to-back sequence steps, you can immediately follow up a call (or an email, social action, or text) with another touch point. For instance, if you call someone and they don’t pick up, you can instantly fire off a text or an email letting them know you tried to reach out and missed them. One large technology customer increased their call connect rates by 30% by following up missed calls with text messages. Learn how to set it up here. When you have a prospect on the line who is ready to buy, you want to focus on giving them what they want in the fastest and most efficient way possible. 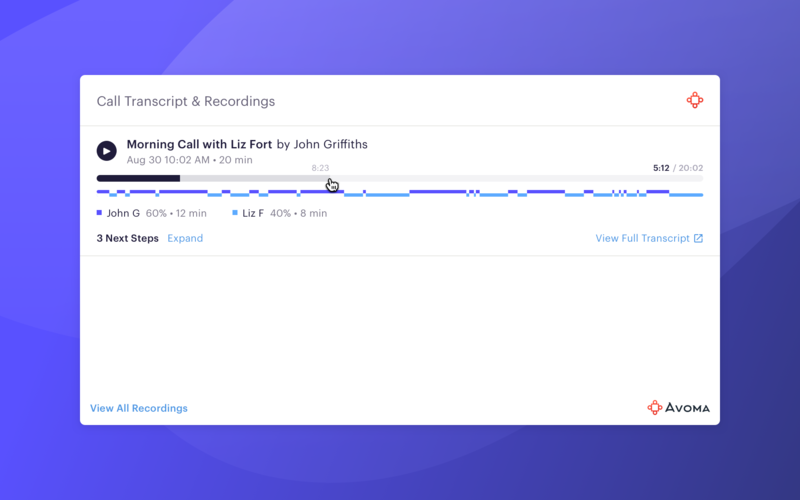 We’re excited to announce warm transfer, which allows Outreach Voice users to seamlessly hold and transfer calls between reps without hanging up on a prospect. Warm transfer on Outreach Voice lets reps transfer calls to a colleague in one click without hanging up on the prospect and starting a new call. You likely have time sensitive tasks that need to be completed no matter what task you’re working on at the time. For example, you’re talking with a prospect and they tell you to call them back at 2pm. Urgent Task Alerts let you create prioritized tasks. When a task is created, you can set the priority as “urgent” and, when the task is due, you’ll be notified and prompted to complete the task anywhere in the application. Excited about the new Gmail experience? Us too! Now Outreach for Gmail works with the new Gmail design. Bonus update: now you can see engagement insights (click and open tracking) in your inbox, in addition to your sent folder and your message threads! Outreach Everywhere support: Now you can see opportunity information when navigating Outreach Everywhere. See opportunities closing this month in just one click! The opportunities page is now responsive so you can access opportunities information on smaller screens, like your phone. We’ve all had that faux pas of missing a meeting because you thought it was at 10AM PST but really it was 10AM EST and you were still in line at Starbucks by the time the meeting came and went. We’re making life a whole lot easier as you schedule across the country (or world!) by adding time zones into Outreach Meetings. Now you can select which time zone your meeting should occur, if different from your own, so you never have to fumble through the mental math of "What time is it in New York?" again. Never miss a new feature with our Product News RSS feed.